When opening your Dashlane account on a new device, or when signing in to the web app on our site, you will be asked to authenticate the access with a 6-digit security code or with your two-factor authentication code. Remember that if you try to log in to your Dashlane account too many times using either an invalid security code or two-factor authentication code, or else using the wrong Master Password, then your account will be blocked. If this occurs, please contact User Support. By default, a 6-digit code is sent to your email address. Note that your contact email address can be changed from inside the application on Windows (using the Tools > Preferences > Account menu) and Mac OS X (using the Dashlane > Preferences > Account menu). Try with a new security code. You can get a new security code by clicking on the Resend button on the login box, or by quitting Dashlane and trying to open your account once again. Also check your spam or junk mail folder in case the new security code ended up there. Please refer to this article for more info: How do I use my account on a new device, or after reinstalling my computer? 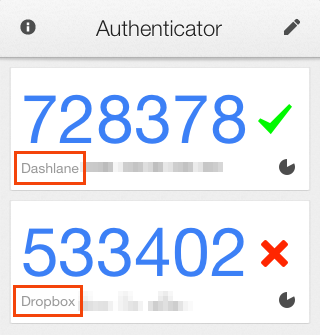 You need to keep your Dashlane entry in the two-factor authentication app so that you can get a new code every time you log in or add a new device. Make sure you are using the code for Dashlane and not for another app. When you set up your two-factor authentication, ten back-up codes have been generated and displayed at the end of the process. If you saved them somewhere, you can use one of these instead of your two-factor authentication code to log in to Dashlane again. And remember that a back-up code can only be used once. To get more backup codes, please enter your email address directly on this page or using the link below. We will automatically text you more backup codes to your backup phone number. Note that two-factor authentication cannot be disabled on iOS or Android for now. If you're still having trouble logging in or you need your account unblocked, please contact us.